I shouldn’t even have brought it up–I hate talking about it because I hate thinking about it. But oh, my poor knee! It twinges on the outside, a slight but sharp tug that tells me something is still wrong after five months. Every time it happens I want to cry a little bit from the stress of not knowing what it is, of worrying that it will give out, that I’ll strain it too much, that I could maybe never run again. You might think I should see a doctor. Well, I’d like to. But I don’t have health insurance. Diagnosing a knee injury like mine starts with a visit to a physician ($$), who will likely refer me to a specialist ($$$). The process will probably include an MRI ($$$$), but you can’t be sure the results will be conclusive without further testing (potentially endless $$$). It gets scary if they find something bad, like a meniscus tear. 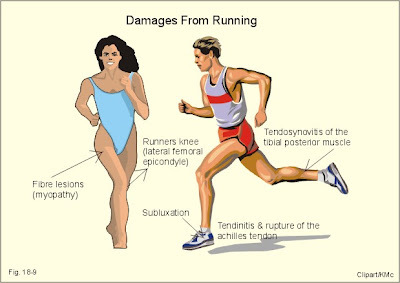 At the very least I’d be looking at physical therapy (weekly $ for who knows how long) and a long time away from running. At the worst? Surgery ($#*! ), which offers no guarantee I’d ever be able to run again (and it’s $$$$$). Not to mention the $ I’d be losing since I couldn’t work–there’s no paid leave for freelancers unless it’s mandated by the government, like FMLA or worker’s comp. I’d rather be on the StickDeath track team than have knee surgery. It’s probably more conducive to running. Instead of going that route, I went to a sports medicine clinic way back when I originally hurt my knee. I took a day off work to go to a beautiful office in SoHo where I was seen by a fantastic doctor (a runner himself) who specializes in ART and other therapies for athletes. I was unpaid for the day I took off and the visit cost me two days’ work. And when I told them I could really only come in again on Saturday or Sunday they suggested I wasn’t serious about healing. As a freelancer it’s easy to fall through the cracks of a system that’s built around people with steady jobs that have nice, normal benefits like sick pay or the ability to take a couple hours away to visit a doctor. That’s not my life, so I need different options – but does that really make me somehow less entitled to care than someone in a more traditional situation? As for insurance, sure I guess I could get my own…if I could afford it. My rent is pretty cheap by New York standards, but even then my tiny artist budget can’t even stretch to accommodate the cheapest plan at the Freelancer’s Union (Even if it could, the deductible is $10,000! How the heck does that even help me??). Even so, I make a lot more annually than someone who could qualify for public health care plans. Frankly with the system the way it is I’m sometimes shocked that anyone even buys into it. I have these crazy fantasies about a world with no health insurance, a world where anyone can walk into a hospital with his guts falling out and receive help without fear that his children’s children will be bankrupted by the resulting medical assistance. I call this world Canada. I made this just for you, Canada. The whole situation is really frustrating, to the point that I just want to turn on an episode of Degrassi High and forget about it. But seriously, since I want to be running well into my masters years I know I’ve got to take care of my body…so what’s a girl to do? Eventually I’ll be eligible to join a union, which means health benefits, and my rate of pay will increase, which means not panicking about the cost of physical therapies like massage and ART (and the dentist, and the optometrist, and the gynocologist). And remember, it’s really just two short years until ObamaCare forces me to buy into the health insurance system one way or another anyway (I’m inclined to feel positively about it but it seems so fascist). So I know there’s a future for me that won’t include a giant ball of financial stress every time I feel a twitch in my ankle but in the meantime I’m racking up credit card charges, because I don’t seem to have any other choice. I know I can’t be the only one out there who’s running uninsured. Are you? Stick Death gets me every time! Seriously though, I’ve heard people argue that if you don’t take care of yourself and eat right and exercise you don’t deserve to be insured. But what about someone like you who’s trying to do the right thing by exercising and gets injured. You can’t live in a bubble! And then others argue that you need to buy the insurance and skimp on other stuff. Like if you can afford running shoes you can not buy them and pay the freelancer insurance premiums instead. But as you mentioned this makes absolutely no economic sense. The premiums are outrageous and the benefits almost non-existent. You’d end up paying more out of pocket between the premiums, co-pays and deductibles than you will pay for occasional treatments while uninsured. Let’s just hope you don’t end up with a chronic debilitating disease for a couple of years! And I’ll never understand why anyone should be denied the right to live because they’re poor, uninsured, etc. I know others have differing views on this and I really try to understand, but I’m often perplexed by those so vehemently opposed to universal access to health care. A few years ago, after months of pretending like it was nothing, I had a meniscus tear. I had surgery. You are right, it costs a lot of moohlah. But I was only out from running for 2 weeks. And I only had to go to 1 physical therapy follow-up. So if you do get the chance in the future, and it IS a meniscus tear- just know that it doesn’t mean the end of your career! I’m faster now then I ever was before! Amanda, your comment is like music to my ears! I just wish I could afford a diagnosis. Shelling out dough for treatment is one thing, but when you fear the cost of MRIs like I do the idea of doctors is just crushing. Any thoughts about money are just crushing right now, having been out of work for a few weeks! I think I’ve moved on from the idea of a meniscus tear anyway. 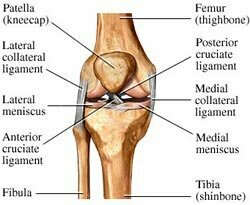 It seems like it’s more likely some kind of damage to my Lateral Collateral Ligament (LCL) on the outside of the knee (left, below). Anyway, I’m still glad to hear it wasn’t as scary as I’m making it out to be in my head, and I’m glad you healed up okay! I’m also a freelancer (a writer), but I’ve always had insurance. It’s a lot more expensive than it would be if I was working for a company, but as a self-employed person I can fully deduct the cost of premiums, so it’s definitely worth it. Especially when you consider that, even if you’re basically healthy, you could get hit by a car, etc. (which is what happened to a friend of mine). What’s more, a minor injury can get worse if not treated. I was without insurance the last four years. I just recently received insurance through my employer but I can relate to weighing the costs and benefits. I had an emergency room visit twice in those four years. The first one I didn’t have to pay anything as I qualified for the poverty level at the time. The second time (a bug flew in my ear!) I didn’t qualify, most likely because it was out of state. It’s pretty hit or miss. James doesn’t have insurance either. And while it’s very risky for freak accidents and major illnesses, he has found that it’s sadly cheaper to pay out of pocket for things than using insurance, mainly because any plans that are available for an individual are pretty steep. Just recently a family friend of ours outlined the proposed Obama health care plan. He compared it to how Medicare is already taken out of our paychecks so basically nothing will change and “all” will be insured. I liked the sound of it, at least from his perspective! P.S. Your post pictures were AWESOME. The sad part is even with insurance everything is so expensive. I just got my bill for about a month of physical therapy and my eyes almost popped out of my head. Healthy people like us should like Obamacare. Insurance companies will strive to attract customers which will mean lower premiums and assuming the mandate stays in place, the premiums for individual insurance should be more affordable (risk is spread out). Coming from you, the health insurance maven, I believe it! Thanks, Jen! Seeing as I seem to have started this debate somehow…Freelancers Union costs about $325. a month for one of the basic plans – not one of the ones with a 10k deductible. Basically, $10. a day. Is there absolutely nothing you can do to make $10. a day and pay for health insurance? The debate started long ago, Steve, you just gave me a great segue into my story (and an excuse to point people toward NYCRuns, which is a great resource). I’m aware of the costs of Freelancer’s insurance, and believe me when I say I’ve weighed the costs against going it alone. I mentioned my knee surgery to you on Twitter, but just to join in on the conversation here, even with (pretty decent) insurance by the time the whole thing from diagnosis to completely healed is said and done we’ll have paid about $1000. It’s absolutely crazy what medicine costs in America. And by crazy, I mean pathetic and sad. That being said it is also amazing what they can do with modern medicine. I had tears repaired in both of the meniscuses in my right knee on Friday and was walking without crutches by Sunday night. I’m still three weeks away from running, but still, in terms of what you would normally think of with knee surgery, it’s absolutely awe inspiring! Wow! That’s amazing! I know Cinnamon’s going to be way less scared about her knee after reading how relatively easy your surgery went and recovery is going. I hope you continue to have a super awesome quick recovery and are back up and running soon! Along with the other comments here, try to find inexpensive health insurance as well. The need for affordable ones is all over the place and providers are certainly taking notice. A comparison site for medical insurance might be in order at this point.